A toy controller – in a good way. 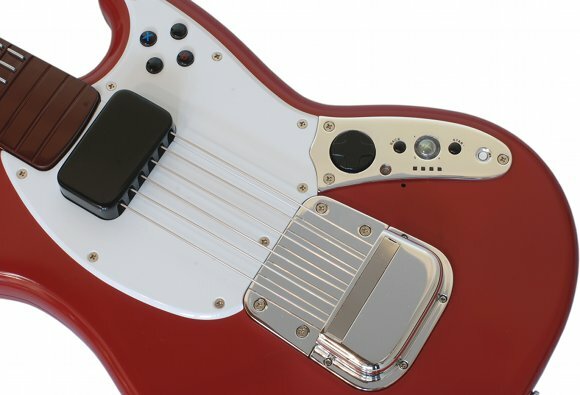 The Mustang Pro guitar controller for Rock Band 3 is equipped with a full MIDI implementation and standard 5-pin port to connect to synths and computers. Since the very first Guitar Hero game, musicians have found ways of converting game music controllers into genuine music controllers, through various hacks and tricks. But now, no hackery is needed: Rock Band 3’s new “Pro” controllers ship with actual MIDI DIN ports on the back. With the help of Harmonix, we get to look inside how that MIDI implementation works. Non-guitarists won’t mind the buttons: there’s no need to build up callouses. And the frets are located in the right place, so if you do know how to fret a guitar, you’ll find it usable. 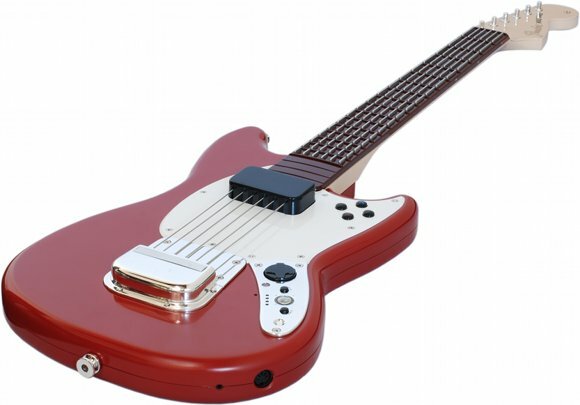 The other big upshot is price: with a street price of US$150, the Mustang is on the high end of game controller, but very much the low end of things that can simulate a guitar with MIDI. I don’t yet have a Mustang on-hand — I’m hoping I can find a real guitarists to give one a full play test when it ships late in November. But I can describe how MIDI works on the device. Here’s the pleasant surprise: just about everything onboard is mapped to MIDI, including even the game pad and tilt sensor. And there are even two play modes for additional flexibility when you’re working with MIDI. Configuration instructions: step one, turn it on. (The PS3 and Wii version will have an actual power switch; on Xbox 360, you have to hold down the Guide button, just as on other Xbox controllers.) Step two, plug in a MIDI cable (the one with 5 pins that we’ve been using for over a quarter century). Step three — there is no step three. Turn it on, plug, and go. Octave: Increment and decrement octave are the left and right action buttons (X and B on Xbox). Program change: Increment and decrement are the top and bottom action buttons (that’s Y and A on Xbox). Transmits on channels 1-6. No, really. There’s a program change message implemented on this thing. The default is 28, the patch for a clean electric guitar in General MIDI. D-pad buttons switch functions for the pedal, from foot controller to channel volume to expression. Pedals: Connect an analog pedal, and you can use continuous expression or volume. Connect a digital stomp (that is, one that’s either on or off, like the bass drum pedal), and you send a damper pedal / sustain message. MIDI channel: By default, the guitar transmits on channels 1-6 — that’s in order to transmit strings separately. Each of the six strings is a different channel. “Strum mode.” Hold a fret, then strum the string. The note is sent when – and only when – you strum. The pitch is set by whichever fret is closest. That note is held until you change a fret. “Synth mode.” Strumming a string or changing frets will generate a note – meaning, if you like, you can use that fretboard as a 102-key keyboard. (Microtonal fans, go nuts.) Here’s the odd part, though – you need the strum to set velocity, so whichever strum you’ve last strummed is your current velocity. While it’s called “synth” mode, this is the only mode that allows hammer-ons and pull-offs. We’re going to need to get the actual guitar and shoot some video before that really makes sense. But you get the idea. You can adjust pitch up and down 4 octaves in either direction. LED feedback gives you information on what’s toggled and what isn’t, though my guess is you’ll just listen rather than try to squint at the LEDs. Described in this story is the Mustang Pro, but you can also look forward to this Squier Stratocaster for Rock Band 3. It’ll have all the MIDI features, but with real strings over the frets – it’s a real guitar. If those buttons look unappealing to you, Rock Band 3 will have an alternative with real strings, the Squier Stratocaster. In many ways, the Squier is more interesting – especially to actual guitarists, and not just people looking for a new way to fiddle with soft synths. With real strings, it ceases to be a toy, and while pricing and availability haven’t yet been announced, it’s likely to be the cheapest MIDI guitar solution out there. I’ve confirmed that the MIDI implementation on the Squier will be similar to the Fender Mustang Pro – same channels and messages. It lacks the pedal inputs. Engadget did a nice hands-on preview of the Strat, with photos and video. With both “Synth” and “Strum” modes possible, I think Harmonix and Mad Catz may have a hit here. For someone who isn’t quite ready to commit to a MIDI guitar yet but just wants an alternative way to track some MIDI lines, it’s hard to beat basic input for $150, with frets in the right place instead of a piano keyboard. For other applications, I can imagine having some real fun – with the accelerometer and “Synth Mode,” the guitar becomes a very viable, absurdly cheap, velocity-sensitive controller for strange new synths and other creations. It’s probably some of those oddball applications that will appeal most, as I suspect real guitarists will hold out for the stringed-fret Squier, leaving the buttons to the rest of us. Beyond MIDI: These are wireless Xbox 360 controllers, too, so if you have any tool that can talk to Xbox controllers on PC, you should theoretically be able to rig up something wireless that doesn’t involve MIDI cabling. But I like the ability to plug into hardware synths with MIDI, no computer necessary, too – and as I say, those MIDI ports are often “free” on gear you already have plugged into your computer. Stay tuned for when this ships. Hopefully that gives you an idea whether you want to pre-order this sucker. Knock yourself out.